Many of the property pages for this action use properties which are identical to the properties in Delphi IDE. The properties on the Compiler, Linker, Directories and Version Info pages are described in the Delphi Help File. Note that you may use FinalBuilder Variables in the Directories page but not on the Version Info page. This action can also be used to maintain the version info for the selected Delphi project. When the AutoIncrement property (on the version info tab) is enabled, the version number properties (Major,Minor, Release and Build) are persisted to a file (yourproject.fbd) after the action runs (and after the AfterAction script event). These values will be restored when the project is loaded. If the action fails, the values are not persisted. This makes the AutoIncrement property function the same as it does in the Delphi IDE. The options that are specific to FinalBuilder are provided on the Project property page, pictured above. Icon file : This is the path to the icon that will be used as the main icon for the application. When you select a project file, FinalBuilder checks to see if there is a resource file with the same name as the project (ie the default one generated by the Delphi IDE). If the file exists, FinalBuilder extracts the MAINICON resource and saves it in the same folder as mainicon.ico. This is needed for the resource compiler. Compiler Version: Choose the version of Delphi to use to compile. Work around Delphi 5 Compiler Bug : Check this property (which is only enabled when the compiler version is D5) to work around the problem where the project compiles fine but no executable is produced. The will save having to work around it manually by adding a second action. Use EurekaLog Compiler : Check this property to use the EurekaLog compiler instead of Delphi. See the Using EurekaLog topic for more information. Use Settings from Project File : Checking this box will cause FinalBuilder to ignore any settings made on the action's property pages, and instead always use the values from the project settings file. You can choose to apply this option only to certain groups of settings, any combination of Packages, Compiler, Linker, Directories and/or Version Info can be loaded from settings. Note that checking this option disables the relevant property page(s). Project Config : (Delphi 2007 only) Select which configuration of the project you want to build. Build All : Tells the command line compiler to rebuild all files in the project. This is checked by default. When not checked, the command line compiler will only recompile modified units. Update Package Source : Enable this option to update the package source with changes when the action runs. 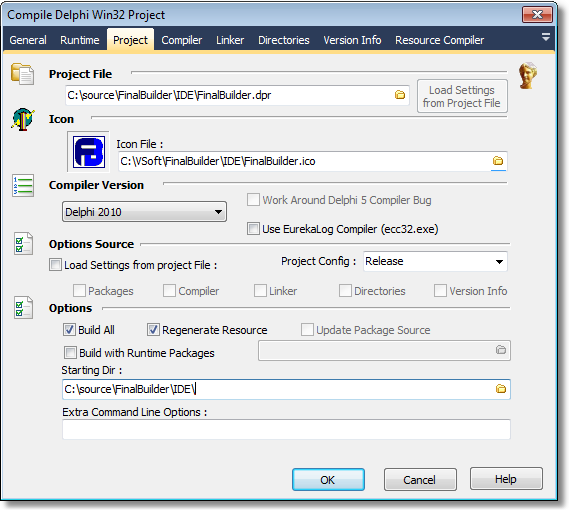 Build with runtime Packages : This is the same as the equivalent option in the Delphi project options. Starting Dir : Select the starting directory for the action. Extra Command Line Options : Enter any extra command line options to be passed to dcc32.exe. NOTE: You need write access to the directory you are compiling the project from, as FinalBuilder generates temporary .cfg file for the command line compiler to use.